When physicist Mark Kuzyk throws a science soiree he doesn’t mess around. 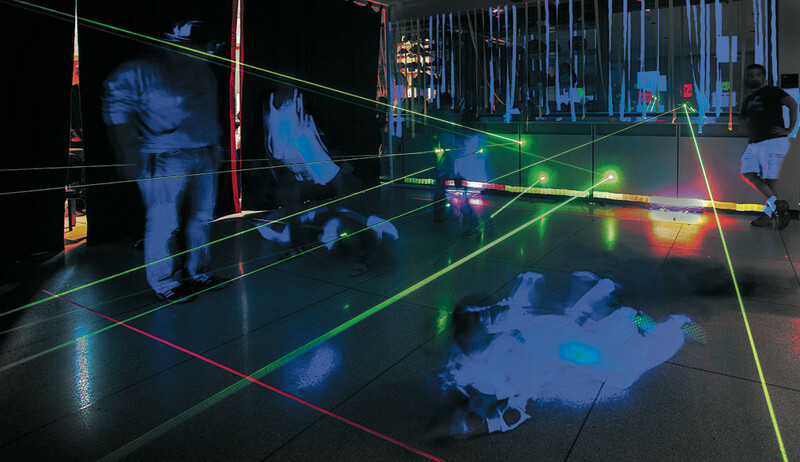 Out come the lasers, high-tech origami, ornate wire sculptures, and sticky-stretchy gel that’s fun to throw at the wall. But it’s all for a greater purpose. 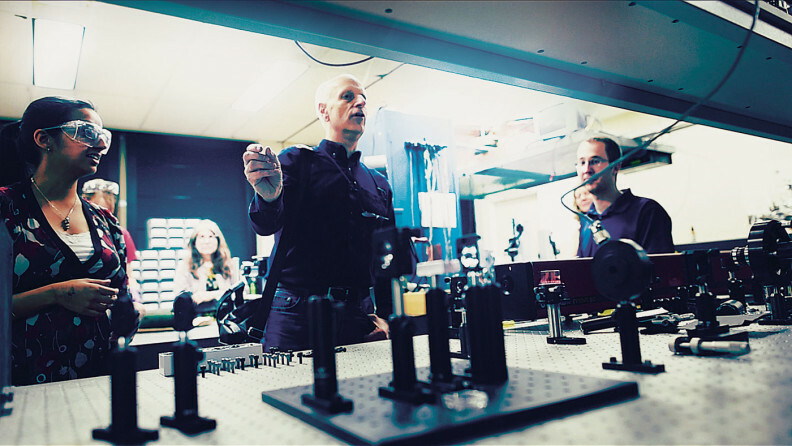 The Washington State University Regents professor is developing a shape-changing, laser-guided electrode for the treatment of pain, Parkinson’s disease, Alzheimer’s, and depression. The ultra-thin electrode is designed for use in deep brain stimulation (DBS) and relies on optics and photomechanical materials to improve the precision and delicacy of the procedure. Sometimes known as the “brain pacemaker,” DBS holds promise for a wide range of conditions and may also speed recovery from brain injury, says Kuzyk. Most surgically implantable electrodes are metal rods 1-2 mm thick, large enough to damage the brain during placement. They are also difficult to reposition. Kuzyk’s prototype electrode is a flexible polymer fiber only 100–200 microns wide with tiny embedded wires. It will also contain photomechanical material capable of changing shape and direction in response to light signals. The slender fiber is gentle on brain tissue and its insertion can be monitored for real-time viewing by the surgeon. If the electrode veers off course during the procedure, a laser can be turned on causing the fiber to bend back to the desired location. Andres Lozano of the University of Toronto Division of Neurosurgery is also taking part in the study and has been active in deep brain stimulation research for over 20 years. In a letter to project funder National Science Foundation (NSF), Lozano writes that the ability to adjust an implanted electrode, without requiring a second surgery, would greatly enhance the benefits and decrease the side effects of DBS, potentially helping thousands of patients. Kuzyk says introducing even one photomechanical filament to allow sideways motion of the electrode could make a major contribution to the field of brain research and therapy. Kuzyk and his colleagues are now half way through the four-year project and—per NSF public outreach requirements—recently demonstrated their science to high school students and teachers from the Los Angeles County High School for the Arts. The three-day workshop, organized by postdoctoral researcher Zuli Kurji, dazzled with laser demonstrations and hands-on experiments. Visitors donned safety glasses and sent red light shooting through polymer filaments. They moved photomechanical material with green light. They tried their hand at pulling liquid crystal gels and elastomers into long fibers the consistency of the 1980s kids’ toy Tacky Stretchoid Warriors. The group also explored the connection between physics and art in a front-row session with origami master Robert Lang who demonstrated light-activated and mathematical origami techniques. The visitors later had a chance to create ethereal 3D sculptures under the direction of California wire artist Elizabeth Berrien. Both Lang and Berrien are WSU adjunct professors. A natural showman, Kuzyk knows how to make science fun. But it’s his day-to-day work in the laboratory that advances the field of optics and provides practical applications for his discoveries. Those stretchy filaments, for example, could one day find use in such non-medical applications as stretchable electronics, shape-changing fabrics, and adaptive antennas.